This year I have decided to make little shortbread gifts for friends and family for Christmas, I have already made 2 batches and they don’t stay around for long! They are super easy to make and the recipe can be easily doubled. – If using a food processor mix all ingredients together until well combined and starts to create a ball. – If the butter is cold it will form a breadcrumb like texture, if you tip this out onto a clean working surface and start to work it together, the heat from your hand will help soften the butter and form a ball. – If you do not own a food processor rub the butter into the flour with your fingertips, when well combined add the sugar and repeat step 2. 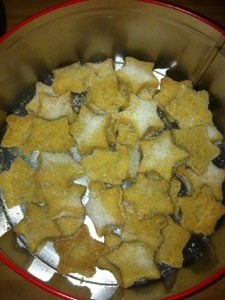 – Flour a clean work surface and roll out the dough to around 1/2 cm thickness for crisp biscuits. – Cut out your stars and place onto a baking tray lined with greaseproof paper. Any left over dough form back together with your hands, roll out and cut more stars!! – When all stars are cut, places baking trays into the fridge and chill for 30 mins. – Preheat oven to gm4/160 fan/ and bake for 10-12 mins. 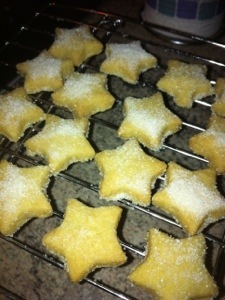 – When cooked the shortbread will start to bubble on top, and be a very light golden brown. – Remove and place on a wire cooling rack and sprinkle with sugar while still warm. 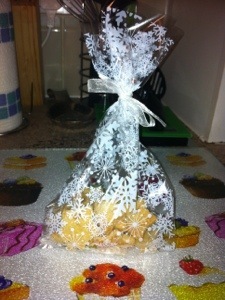 I have some cute little bags I like to put these in to give to people at Christmas. These polythene bags are easily found online.